In the world of positive reinforcement (reward-based) dog training, the term “correction” almost seems like a bad word. For many people, it conjures up images of old school trainers that use aversive, physical methods and tools to train and control their dogs. As a matter of fact, many dog training facilities that only use positive reinforcement (+R) techniques never mention anything about giving corrections because it’s often perceived as politically incorrect. But does that mean using any corrections with positive reinforcement training is taboo? I’m a big believer in positive, reward-based training because it works so well when training dogs on desirable behaviors we want our dogs to repeat. But how do we deal with those undesirable behaviors we want to stop, like when a dog snatches a doughnut off the kitchen counter or grabs tissues out of the bathroom trash can? In those situations, certain types of corrections might be necessary. A correction is something you do to stop unwanted behavior, but that doesn’t mean it has to be physical. I always cringe when I see someone hitting or alpha rolling their dog and forceful jerking or leash pops can cause some dogs to become leash aggressive. Those types of corrections can also break down the bond of trust between you and your pup. The type of corrections I use with Haley are subtle signals that let her know that I want her to stop whatever she’s doing. Here are some examples. Verbal “Uh-Ah” – This serves the same purpose as saying “No” but it’s more specific and only used with Haley so she doesn’t get confused when she hears “no” in other conversations. Finger Snap – I snap my fingers to get Haley’s attention which makes her stop whatever she’s doing and look to me for direction. Body Blocking – Physically stepping in front of Haley and blocking her from moving towards something she wants also makes her stop, sit and look at me for permission or direction. All three of these corrections are non-physical techniques that can be used to stop a behavior without being threatening or undermining the bond of trust you have with your dog. They are technically corrections, but they’re not delivered with anger and they have nothing to do with trying to be dominant or an alpha dog over your pack. They’re more about getting your dog’s attention than anything else. I often think of the parallels between raising kids and raising dogs. I think it would be impossible to raise well-adjusted kids if you only doled out rewards. Both kids and dogs need occasional discipline and corrections. Mothering dogs instinctually demonstrate this with their puppies long before they arrive in our homes. Whether you believe in using corrections with positive reinforcement training or not, it’s always important to remember that every dog is different and there’s no one size fits all method of training. The best trainers consider the breed, personality, history and temperament of the individual dog and strive to be as close to the positive end of the training spectrum as possible. To learn more about the science behind positive and negative reinforcement and punishment, check out this video on operant conditioning. 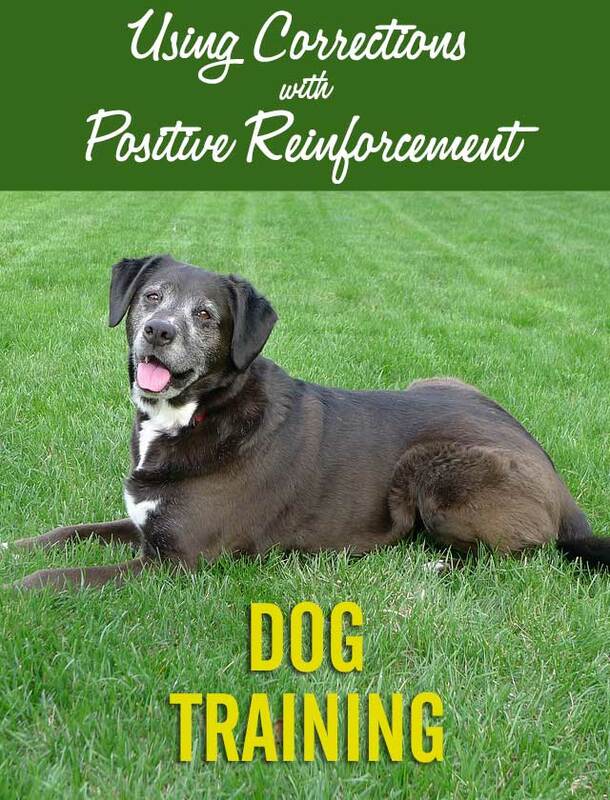 Also visit Victoria Stilwell’s website to learn more about positive reinforcement training techniques! 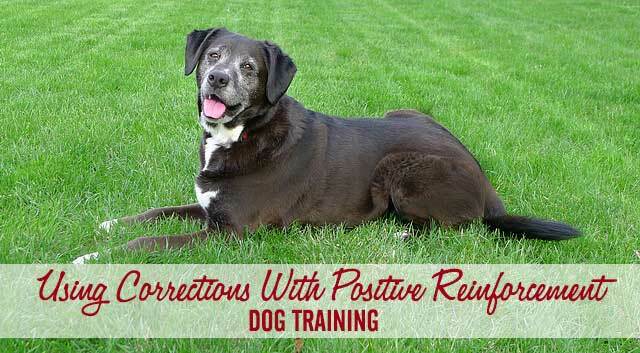 What are your thoughts about using corrections along with positive reinforcement dog training? I agree that there has to be some kind of correction when you really need to stop something bad your dog is doing. With Luke I learned it had to be a firm “no” or “hey” with even a bit of a raised voice (not yelling but not normal volume either) in order to get his attention. I observed him carefully to be sure that it wasn’t upsetting him when I did this and I’m sure it does not. However, with other dogs (like our Sheba) a raised voice can be upsetting so I think the key is to be sure whatever you’re doing is working, and also not stressing out your individual dog so that it’s counter-productive. That’s a great point, Jan! Some dogs are more sensitive to different corrections. It’s interesting when Haley hears “Hey!” from us or other people since it’s part of her name. She seems to know the difference between when we’re addressing or correcting her versus when it’s said in other contexts. I train a positive interrupter, I also use body blocking and if I have to I will yell “hey!” but honestly, I don’t have to do it that often. Another way to give a dog a “correction” is by giving them a timeout by either removing them or removing the reinforcement. Generally when I have to yell “hey!” it’s because their play has gotten out of hand or someone is being too rough with a cat. I prefer to ask them to do something they know instead of yelling “hey!”, like recall and then redirecting them onto something appropriate. That being said, I fully believe in prevention of unwanted behavior by using management and training together. That means my dogs are taught “leave it” and impulse control around food so they don’t think everything is theirs. We also don’t leave anything out for them to get. To keep dogs out of the trash, we use trash cans with secure lids, or place the trash out of their reach, like under the sink. We’ve done so much management and training that the dogs don’t even think to get into things. The more dogs are able to practice unwanted behavior the better they get at it so I believe that instead of using corrections and waiting until they’ve already done something, that preventing it is a way better solution in the long run. Yeah, you said everything I wanted to say only better. You’re the best, Lauren! Lauren, I LOVE your point about preventing having to give too many corrections by managing the environment. There are some things like trash cans that are just too tempting for some dogs (including Haley). Thanks so much for sharing the positive interrupter video. It demonstrates perfectly how to train whatever noise or sound you decide to use. ??? Excellent training tips! Thank you! Thanks, Jeanne! We’re always learning something new around here too from our fellow bloggers. This one is tough one for me, because I always feel like I’m doing something wrong when I correct my dog. I also use the “ah uh” and body block with my dogs. And it’s very effective. I recently spoke with a trainer who advised me to tell my dog what I wanted him to do (speaking of Rodrigo) instead of always telling him what not to do. This has been very successful too and I plan to write about my experience. Ultimately, I’m not a dog trainer and read a lot and ask a lot of questions to learn what I need to raise a happy, healthy pack. It’s not easy and this has made me appreciate professionals. Great tip, Kimberly! I was just talking to my sister about her puppy that jumps and bites quite a bit. That’s a perfect example of when she should tell her puppy what to do instead of saying “No”. I’ll be watching for your post and will be sure to share it with her. I learn something new every day from you and other bloggers that share some really helpful tips! ? When Matilda was a pup, I didn’t know much about positive reinforcement training, so I used No a lot – especially during potty training. It made her more anxious about relieving herself, so it took longer. But now that her recall is pretty strong, it’s easy to interrupt any problem behaviors just by calling her away. When it comes down to it, it’s amazing how much dogs are willing to listen to us when they (mostly) associate us with positive happenings. Sometimes people think positive reinforcement based training is about protecting our delicate flowers of dogs from any hurt or bother, but it’s really just more effective and more enjoyable for everyone involved. I love your perspective, Lindsay! It really is just as beneficial to us enjoying well-behaved dogs as it is to our pups being treated in a positive way. You’re so right about our dogs listening to us when we’re positive and good things happen when they come to us. ? Lol! Sometimes you just have to laugh and let them get away with an occasional antic, right? ? I think you totally need to correct them when they are doing an unwanted behavior. I think they desire to please and want and need to know when they are doing something they should not. Either for behavior or safety. But for sure being positive and making sure they trust us to lead them positively. Yes! I meant to mention that in the post, but I must have got sidetracked while typing away at the keyboard. Dogs like to know what the rules are and they like fairness and consistency. ?? Every once in a while, I’ll use a verbal correction but usually redirection and management work for us! That’s awesome! Thanks for mentioning using redirection. That’s a great way to minimize how often you might have to give a correction. We’re clicker training our current service puppy in training, Archer and our previous pup, Adelle. Most of the time we try to use a positive interruptor (the kissy noise) like in the video @Lauren Miller posted. Thanks for sharing the great training tips! Thanks, Colby! The video is a great example of training the interruptor noise. I didn’t really think about it at the time, but I ended up training Haley’s finger snap interruptor by giving her lots of praise when she looked at me and gave me attention after she heard the noise. Training with treats probably would have worked even faster. Thank you, thank you, thank you! I’ve been meaning to write a similar post, but was afraid I’d get lots of “your a bad dog parent” comments and I wasn’t ready to deal with that yet. Barley went through a phase where she’d nip at my hands in agility and we worked through that with corrections–a firm “hey” followed by a down–and then we’d try again. Eventually, she caught on that if she nipped, she had to stop doing the course and quit nipping. Aw, thanks so much, Beth! That’s a great example of how you trained Barley on what to do instead of nipping. I bet she was just getting a little carried away because she was so excited about having fun with you while racing through the course. ? I love the Uh Ah, except it comes out of my mouth like yak yak yak, but they stop what they are doing and redirect. Lol! That makes me wonder what goes through their minds when they hear all the weird sounds we must make. ? I think you turned out great, Barbara! I was raised that way too. ? I agree with others that it depends on the dog’s temperament. I’ve always used “ah ah” with my dogs, just to get them to pause and look at me. I knew all my previous dogs from when they were 8 wks old, and they had “bomb-proof” temperaments. Shyla, my current chocolate Lab, is an exception who I didn’t know until she was 9months old so I don’t what happened to her before I met her except that it was bad enough to leave her with fractures. Anything that has even the slightest negative connotation dampens Shyla’s confidence and enthusiasm. Even when I meet someone else on the trails behind our house who reprimands their dog, it will literally shut Shyla down (makes her lie on the ground unable to move due to fear). At my request, my neighbors have become very good about not being negative with their dogs around Shyla! – It makes me smile. I think that the biggest thing is to evaluate your own dog and what they can handle. I’m heading over to read about kissy noises as a positive interrupter. That might be perfect for Shyla! You wrote this beautifully. I wouldn’t even put the actions that you described into the category of “corrections” but rather interrupters. Thanks for writing it. Thanks so much for your kind words. ? I didn’t realize that Shyla had a rough start in life with those fractures, but I’m so glad she’s with you now and has a loving home. It sounds like you have some pretty awesome neighbors too! ? I am not a fan of the finger snap. I have seen that pop up in hunt tests and at times a handler has been warned for intimidation (which is not allowed at tests). I agree with you that the best trainers adjust their training to the dog. Hi, Linda! I can see why the finger snap would be frowned upon during hunting tests or trials. Are you able to give any corrections or directions during the test? I am so glad you addressed this topic. When people hear the word punishment it does bring up negative thoughts. However, it is part of the positive training world. The video used a perfect example of the dog barking and jumping and the pet parent turning their back to them. This does not harm the dog, but it does make the dog think what did I do, or what should I be doing. It is part of the positive training reinforcement toolbox of training. Thank you for explaining it, so that more people can understand. This post is a very shareable example. As a positive reinforcement dog trainer myself, this can be ver difficult to explain to new pet parents. Thank you for sharing this. Thanks so much, Suzanne! That’s such a compliment coming from yourself, a very respectable trainer. ? Thanks for sharing the post too! Great article! I have to share this! I use the verbal ‘Uh ah’ with my dogs too! It’s really funny, because I just have to say this very calm and they just know I caught them red handed! Thank you Valerie for sharing the post! I can just picture how your pups react to the “Uh ah” when they’ve been caught, lol! This is such a helpful post, one of my favorites of yours. I shared it in That Mutt’s email digest yesterday. Thanks so much, Lindsay! It’s really nice of you to share so many of my posts. This was one of my favorite articles to write too. I hope you have a wonderful Christmas with your family and Ace and Remy. ? This is beautifully written and couldnt agree more. Im a qualified trainer and have ten years of experience dealing with behaviour modification. Some people hide behind scientific research when infact research is only a survey of certain scenarios. If we put all the dogs in the world in one basket then the outcome would be this……. your post. That’s such a compliment coming from an experienced trainer. Thank you so much, Dave! ?